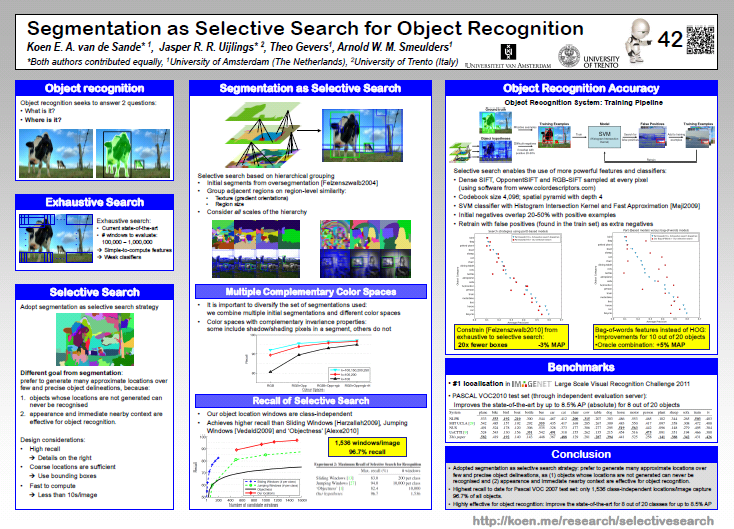 The journal version of selective search is here, as is the software to go with our paper. Matlab pcode is available for our paper Selective Search for Object Recognition. Please cite our paper if you use our software. Run demo.m for a single image demo. Run demoPascal2007.m for the Pascal VOC 2007 dataset. You'll need to set some path here to the dataset. The software is released under the following license and can also be dowloaded from the homepage of Jasper Uijlings. Matlab pcode is available for our paper Segmentation as Selective Search. Please cite our paper if you use our software. The site and its contents are © 2008-2018 Koen van de Sande, except for the files (and other contents) that are © of the respective owners. This site is not affiliated with or endorsed by my employer. Any trademarks used on this site are hereby acknowledged. Should there be any problems with the site, please contact the webmaster.